The Regis School of the Sacred Heart is committed to the religious formation of all of its students as stated in Sacred Heart Goal I (a personal and active faith in God). 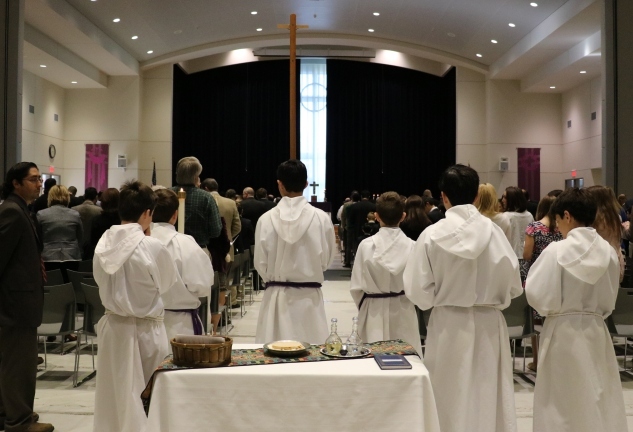 This school year, the Berchmans' Brothers Altar boy society was formed to help Regis boys grow in their faith, in their sanctification, and to continue to build community around the Most Sacred Heart of Jesus. After the altar boy society was formed, the teachers and students felt that a name would help to unify their group. They held a "naming competition" to decide on a name inspired by these saints. 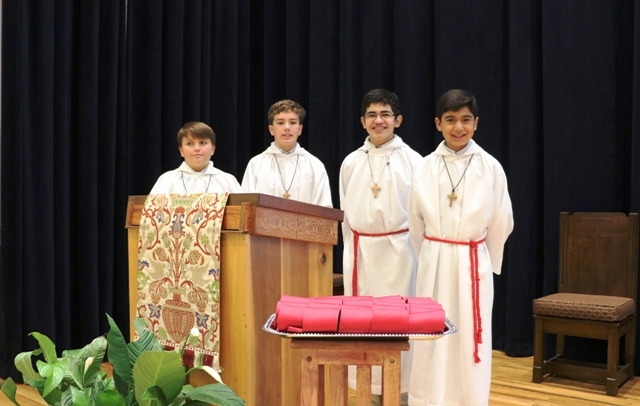 Seventh grade student, Josh McCord, proposed Berchmans' Brothers and that name was overwhelming supported by the altar boy society. This fitting name celebrates St. John Berchman, the patron saint of altar boys who is renowned for his love of the Holy Eucharist. Regis middle school religion teachers, Mr. Juan Masters and Mr. Santiago Ripoll, lead this new program. As Mr. Masters articulates, "The purpose of this program is twofold: (1) To form a worthy guard of honor to Our Divine Eucharistic King. (2) To render faithful, reverent, and edifying service to God by assisting His visible representatives, the Archbishop and Priests, in offering the Holy Sacrifice of the Mass. 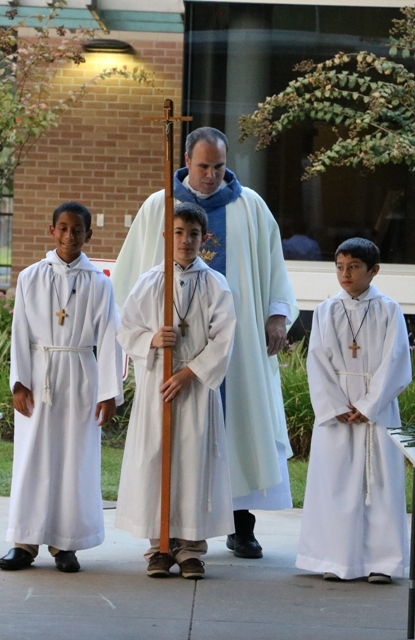 Of course, I pray that the experience of being an altar boy will open the hearts of these boys and help them listen to God's call to the Holy Priesthood." 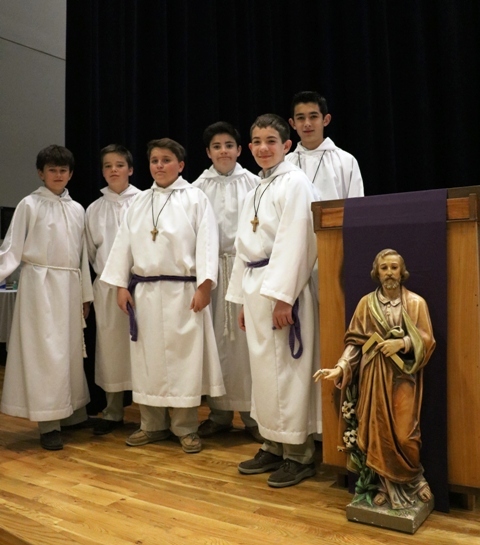 In the fall of 2015, 30 Middle School students participated in a series of trainings which focused on teaching the boys the basic duties and responsibilities of altar boys, but more significantly to help them recognize the important honor and calling it is to serve in this way. The fall trainings culminated in a blessing and commissioning by Fr. Charles Hough complete with recess and snacks. In the future, Regis hopes to grow Berchman's Brothers into a larger presence on campus with additional spiritual and community building activities.